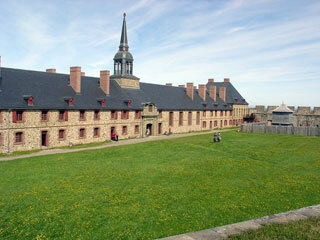 The Fortress of Louisbourg (French: Forteresse de Louisbourg) is a National Historic Site of Canada and the location of a one-quarter partial reconstruction of an 18th-century French fortress at Louisbourg on Cape Breton Island, Nova Scotia. Its two sieges, especially that of 1758, were turning points in the Anglo-French struggle for what today is Canada. This article uses material from the Wikipedia article "Louisbourg Fortress", which is released under the Creative Commons Attribution-Share-Alike 3.0 License.